Two specially ground punches make fitting the 870 ejector spring and housing onto Remingtons' unique 2-step rivet a snap! The hole in the face of the #1 tool allows you to fasten the ejector housing to the receiver with the lower portion of the rivet. The #2 tool is then used to secure the ejector spring within the ejector housing with the upper portion of the rivet. Deluxe Kit combines the above two punches with an ejector spring rivet cutter that lets you take off just the peened area of the front rivet. Often lets you re-peen the existing rivet. SPECS: Punches - Hardened steel, blue finish. 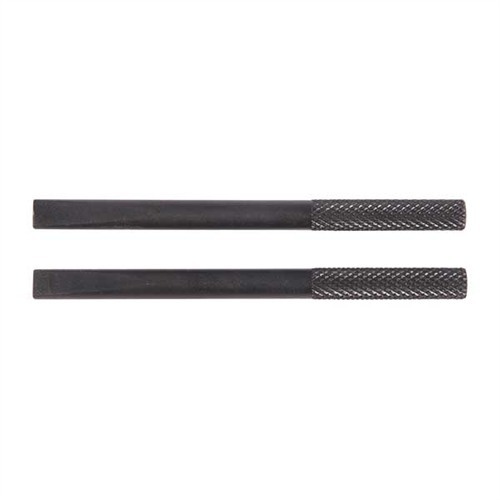 2 punches, each 3-½" (8.8cm) long. 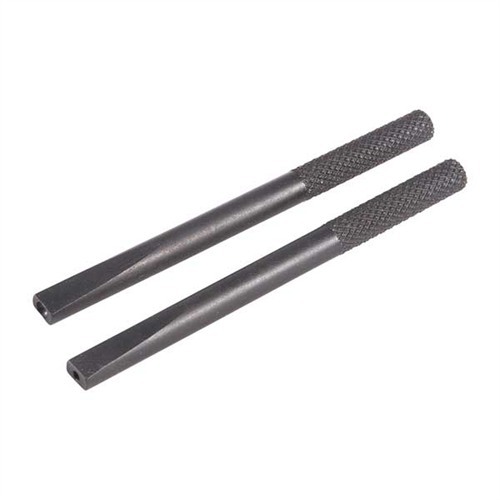 Rivet Cutter - Steel shaft and hardened steel cutter. 2-½" (6.3cm) long, .31" (7.8mm) shaft diameter, .143" (3.6mm) cutter diameter. To spesielt bakken slag gjør montering 870 ejektor våren og boliger på Remingtons' unike 2-trinns klinke et blunk! Hullet mot the #1 verktøy lar deg sy ejektor boliger til mottakeren med den nedre delen av klinke. #2 verktøy brukes deretter til å sikre ejektor våren i ejektor bolig med den øvre delen av klinke. Deluxe Kit kombinerer ovenfor to slag med en kaste vår klinke kutter som lar deg ta av bare peened området foran klinke. Ofte kan du re peen eksisterende klinke. Spesifikasjoner: slag - herdet stål, blå slutte. 2 slag, hver 3-½"(8,8 cm) lang. Klinke Cutter- Stål aksel og herdet stål cutter. 2-½"(6.3 cm) lang,. 31" (12.5 mm) aksel diameter. 143"(3.6 mm) kutter diameter. The theory on these is quite sound. They worked well once I hardened the staking tools. They claimed they were hardened to begin with, I found them to be dead soft. Works great and is a must have along with spare parts if you plan to use your 870 as a wrol/shtf gun. Easy to use and with good instructions. Had no problem with the hardening like the other gentlemen. Let me start off by saying that this tool set is adequate if youâre just replacing the ejector spring. If you need to replace the entire ejector assembly this set might give you some trouble. First, the tip of the #1 punch was so wide that it didnât go all the way into the ejector channel. This prevented the punch from going far enough to fully seat the front rivet and left the entire assembly loose. I had to grind the tip down a little to make it narrow enough to bottom out on the inside of the ejector and fully seat the front rivet. Second, the depression in the tip of the #2 punch was too deep to upset the tip of the front rivet once the ejector spring was installed. Youâll have to use a flat punch that fits the ejector channel or do what I did and just use the #1 punch off-center. Lastly, the #2 punch has really thin side walls and mine split after just a few whacks on the rear rivet. A hardened tool should last for many installs. This was a one-time use tool. This set would be much better if they made some improvements. Itâs going back and I might just design my own set before my next 870 ejector install. Tools worked like they should, but the #1 staking tool split down the middle. #2 staking tool may last longer, but be careful. I had made my own rivet stakes when I first replaced the ejector and spring (2-3/4 to 3" conversion) out of some hardened bolts (grade 5, maybe grade 8 would have worked better), but messed up the job and damaged my stakes. Decided to order this set along with new rivets because I didn't feel like fixing the stakes I made. The stake with the large hole was useless. It didn't set the rear rivet at all, just mushroomed it a bit and didn't go down far enough to actually lock the ejector in place. I ended up using the flat side of the other stake to set the rear rivet and that worked just fine. The stake with the small hole worked for the first stage of the front rivet, but the hole is so tight that after setting the rivet I had to clamp the stake in a vice and gently tap the receiver with a mallet to get the stake off the second stage of the front rivet. All while trying not to break it off. Very annoying. I ended up setting the second stage of the front rivet with a small punch from my regular punch set. After setting the first stage of the front rivet the stake was deformed to the point that I would not be able to use it a second time. I gave it two stars instead of one because the one stake does work for the two stage front rivet, but it was a one chance deal as the tool is now useless. Don't buy this if you want to add it to your tool set. Bought this set to replace the ejector and ejector spring on my 870. After reading reviews, I was hesitant to buy but couldn't find any other tools on the market so I went ahead and bought this set. The tool for the rear rivet cracked down both sides and did not seat the rivet tight enough. I ended up using a standard punch to flatten the rivet. The tool for the front rivet didn't even fit inside the ejector. After some work with a Dremel tool I got the punch to fit and managed to hammer the first level of the front rivet flat. To flatten the second level of the front rivet I again used a standard punch since at this point the Brownell's punch was cracked. The only reason this gets a 2 star review is that after calling Brownell's, they refunded my money. 5 stars for customer service, 1 star for the tool set. Produsentnr. : RIVETSTAKTOOL 050806105294 To spesielt bakken slag gjør montering 870 ejektor våren og boliger på Remingtons' unike 2-trinns klinke et blunk! Hullet mot the #1 verktøy lar deg sy ejektor boliger til mottakeren med den nedre delen av klinke. #2 verktøy brukes deretter til å sikre ejektor våren i ejektor bolig med den øvre delen av klinke. Deluxe Kit kombinerer ovenfor to slag med en kaste vår klinke kutter som lar deg ta av bare peened området foran klinke. Ofte kan du re peen eksisterende klinke. Deluxe Staking Kit 050806104310 To spesielt bakken slag gjør montering 870 ejektor våren og boliger på Remingtons' unike 2-trinns klinke et blunk! Hullet mot the #1 verktøy lar deg sy ejektor boliger til mottakeren med den nedre delen av klinke. #2 verktøy brukes deretter til å sikre ejektor våren i ejektor bolig med den øvre delen av klinke. Deluxe Kit kombinerer ovenfor to slag med en kaste vår klinke kutter som lar deg ta av bare peened området foran klinke. Ofte kan du re peen eksisterende klinke.